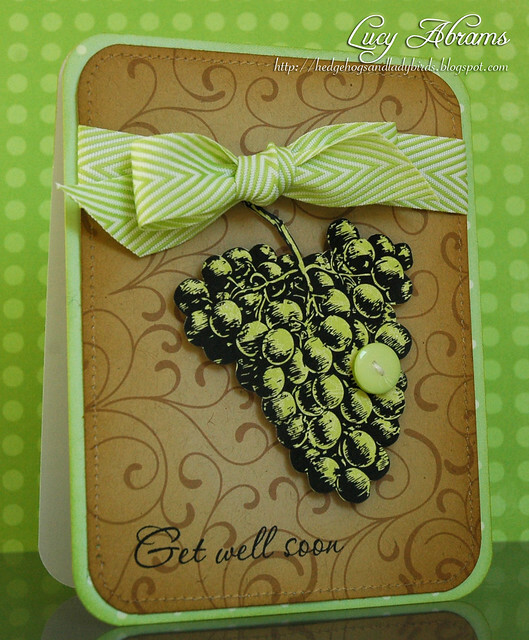 I made my card using a stamp from Hero Arts Artistic Grapes Digikit. We have a tradition here in the UK of giving grapes to a sick person... not sure why... is that something you do wherever in the world you are too?? I created the background using the Flourish Background Digikit which I altered to sepia and printed onto kraft. The sentiment is Papertrey Ink, and the gorgeous ribbon and sweet button are, of course, from The Ribbon Girl. I hope you get a chance to enter the challenge. The prizes are awesome - there's even a fab Halloween mini kit up for grabs (look at that CUTE spider charm!!!). Lovely card Lucy. You are the Queen of Digi's, that's for sure. Your cards always look so beautifully finished! Wow! Love those digi grapes! Beautiful card, Lucy! Such a beautiful card Lucy!